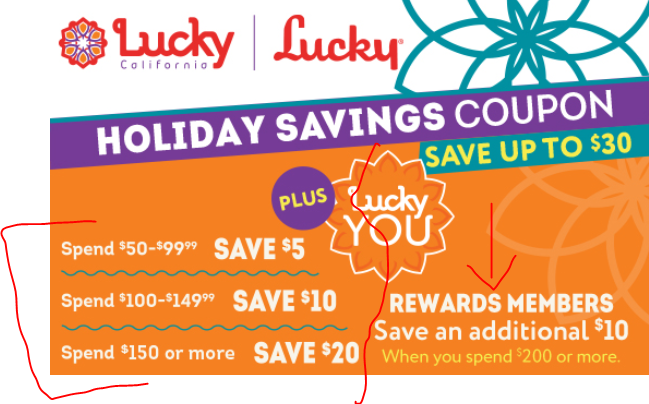 Assuming you’d spend money anyway at any combination of the above retailers, and you also spend money regularly at Lucky’s, it’s like getting a 20% off discount on the purchases made with the purchased gift cards! You get GOLD! Well, sort of! If you are a Lucky’s Rewards member, logon to your Lucky rewards account before the end of day on Sunday 12/24/17 and look under the offers. One of them is a FREE 1.4 ounce bar of the brand new Hershey’s Gold chocolate bar. Add the offer to your account, and then visit a local Lucky’s store and get it for FREE! You have to get it by the close of business on Sunday 12/24/17. 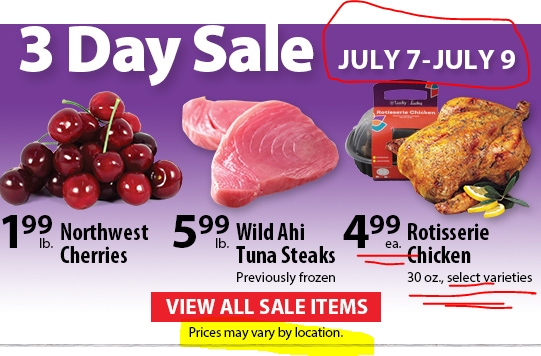 If you are in the Lucky’s grocery store email lists, dig into your inbox for their latest email. It has a coupon code that gets you a discount depending on your order total. The discount is $5 off if your store purchase total is $50+ and it increases as your store purchase total increases. But that’s not all, if you are a Rewards member and you make a $200+ purchase, you will get an extra $10 off. So if you are a Rewards member [free to join], you get $30 off a $200+ order. Exclusions apply as usual. Coupon cannot be used on gift cards, alcohol, smokes, money-equivalents (money orders, etc), prescriptions, lottery, etc. The coupon expires Tuesday night (November 7 in 2017). If you were planning a big grocery shopping spree for the next few days, note that if you are participating in Lucky Rewards, they are offering triple points for purchases made on Saturday and Sunday September 23 and 24 in 2017! To get the bonus points, you must manually add the offer to your account, either using the Lucky Rewards website, or their mobile app. You won’t get a bonus unless you manually add it! If you plan to make a big purchase, that will definitely be a sizeable bonus. And if you are going to be there, don’t forget to stock up on Ben and Jerry’s. They are running a promotion that gets you two pints for $4 total. That’s $2 per pint. You must needs buy them in multiples of two pints to get the discount. Back to Lucky’s again! If you are going to go there to stock up on Ben & Jerry this weekend, or plan to shop there at any time until the close of business on Tuesday 9/26/17, they have a gift card promotion for Lucky Rewards members! If you $100 in any combination of participating gift cards, you will receive 2000 Lucky Rewards points in your account. 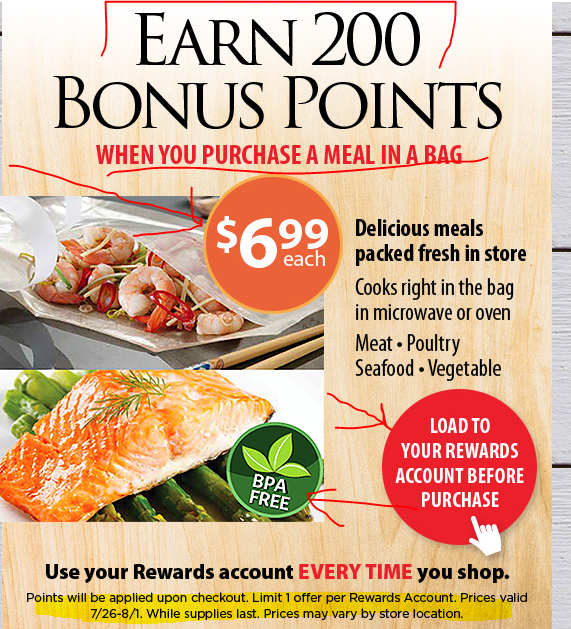 The buying power of 2000 points is $20 (or better). Sometimes Lucky has promotions that get you an even better deal for your points. For example, until 9/26/17, 1800 points get you a $20 off discount on your next Lucky’s transaction. What I’m trying to say is that you may get a better than 20% off virtual round-about discount if the offers work for you. There are some solid gift card options here, including Macy’s, Starbucks, Google PLAY (rarely discounted on their own), Lowe’s, Kohls, and more! If you are a fan of Ben and Jerry pints of ice cream, we have great news for you! Rent a U-Haul and head over to Lucky’s grocery stores between Friday morning through Sunday night. 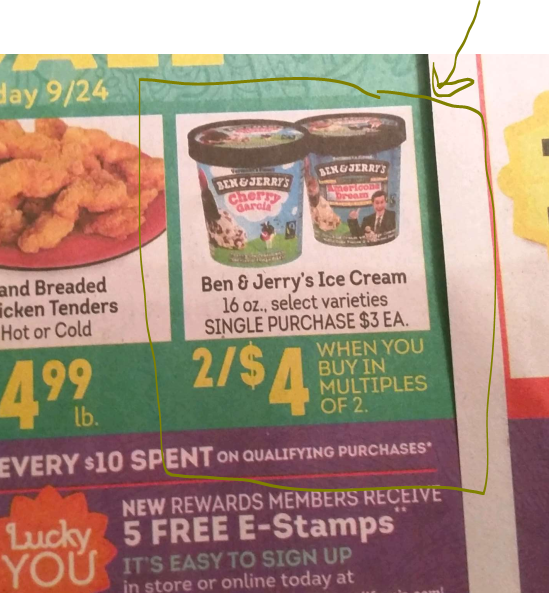 They have a two for $4 promotion on pints of B&J ice cream! You have to buy in multiples of two to get the $2 per pint price. IF you buy one pint, the price is not bad either, but it’s more: it’s $3 for the pint. There’s no coupon code to enter, their cash register automatically adjusts prices. But as always, double check before paying or at least before leaving the store, so you can fix it without having to return to the store! The promotion runs Friday-Sunday, September 22-24 in 2017 at Lucky’s B&M grocery stores. 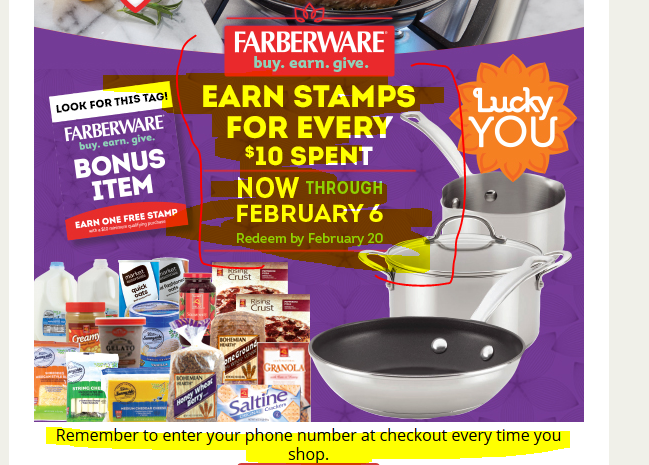 If you are a regular shopper at Lucky’s and you make $10+ purchases on most visits, and you like Farberware, you may be thrilled to learn that the “Earn Free Farberware” promotion has returned and it’s running until February 6 in 2018, so you have plenty of time (almost five months from today). You earn one Stamp every $10 spent there. If your purchase is under $10, you earn nothing. They also run promotions at times for more stamps or bonus stamps when purchasing specific products. You have until 2/20/2018 to redeem your stamps for free Farberware products. If you don’t redeem them, they expire. You have to enter your phone number at checkout when you shop! If you are a Lucky Rewards member, you earn e-stamps, so you don’t have to deal with actual little stamps (which can be easy to lose or misplace). If you are not a rewards member, you’ll get physical stamps. 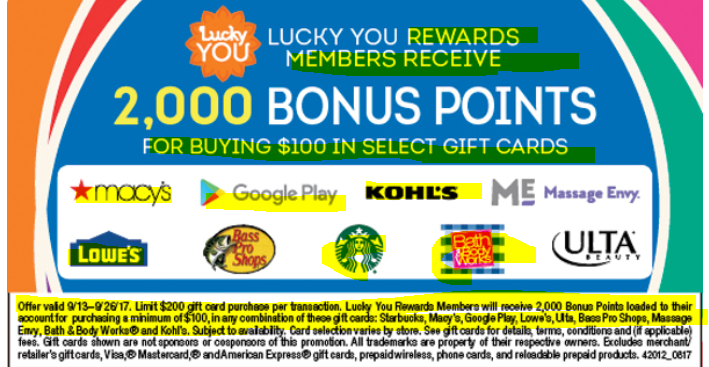 If you are a member of the Lucky Rewards program, especially if you are planning a Labor Day weekend shopping spree, and you spend enough at Lucky where you can take advantage of their Rewards program, then check your email or app! 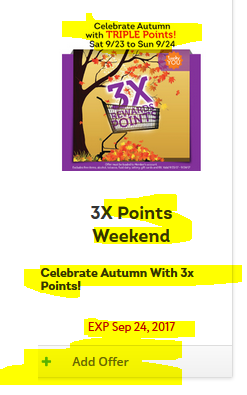 Because between September 1-4 in 2017, they are running a Double Points promotion. But before you earn the double points, you must first opt into the promotion ~ you have to accept the offer! If you live in near a Lucky’s B&M grocery store, and you need to buy some gift cards, you can get a $10 Lucky’s store gift card. The $50 gift cards can be a combination of big chain stores, including Best Buy, Lowe’s, Macy’s, Bed Bath, and more! Details in their weekly ad and their B&M stores. This is a great deal, especially for frequent Starbucks drinkers! Lucky has brought back their gift card bonus promotion, running between August 2-15 in 2017. When you buy $50 in select gift card, the cash register will spit out a $10 Lucky’s Gift card for you. 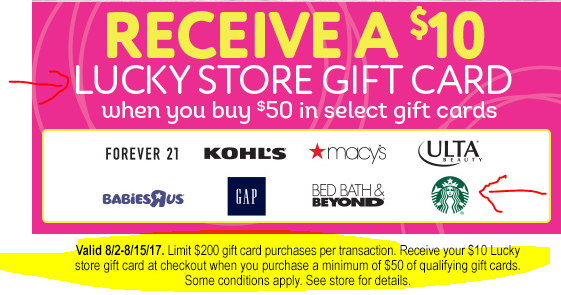 So you pay the full price ($50) for the gift cards, but the next time you shop at Lucky’s, you can get $10 off your purchase! Participating stores include Starbucks which is great, since you can load these gift cards to your account and earn the various Starbucks Rewards promotions as well. It’s like getting a 20% off on every Starbucks purchase made with this card! NICE! The promotion also includes Kohl’s, Macys, GAP, Bed-Bath-and-Beyond and more! Check their ad or stores for more details! There is a maximum of $200 in gift cards purchased per transaction, but there’s no limit on how many times you can do this. PS: I don’t know if Lucky’s accepts credit cards as a payment option for gift cards. If they do, you can also pay with a credit card that gives you more than 1% in grocery store purchases! For example, the AMEX Blue Cash has 3% at the $0 membership tier, and 6% at the premium membership tier. 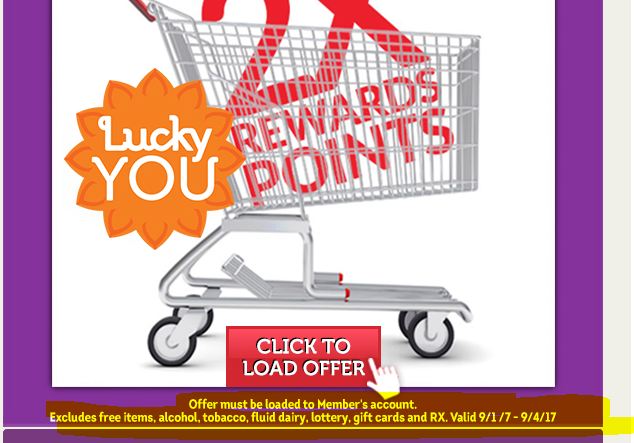 If you are participating in the Luckys Rewards program, check your email or their website/app. There is a new promotion running until 8/1/17 that gets you 200 Rewards points if you purchase one of their microwavable meals in a bag that go for $7 each. They have multiple options, including a veggie option. This is limit one bonus per customer during this promotional period. If you are looking to buy gift cards for Father’s day or Grads or any other occasion, or no occasion at all, Lucky’s brick and mortar stores are bringing back their $10/$50+ promotion. 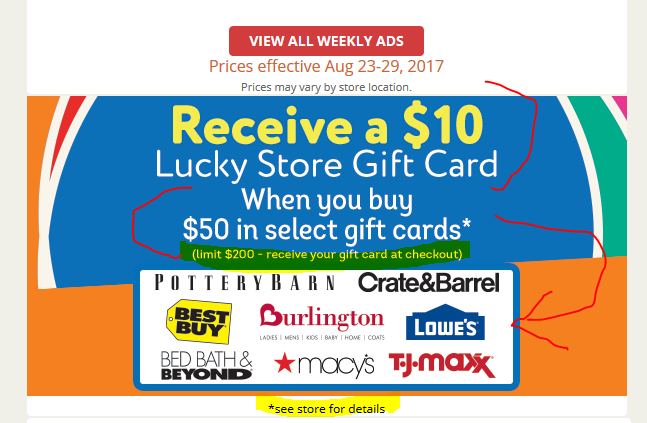 You buy $50+ in eligible gift cards in the same transaction, and their store’s register will spit out a coupon for $10 off your NEXT shopping trip at Lucky’s stores. Eligible gift cards can be found in their weekly ad in their stores and website. They include big names like Best Buy, Bed Bath and Beyond, Macy’s, Kohl’s, XBOX, iTunes, and the GAP family of companies. The promotion runs until June 13 in 2017 at their B&M stores. Limit $200 purchase per transaction. Speaking of Lucky’s, running for the weekend June 9-11 in 2017, you can get their 30oz Rotisserie chicken for $5 instead of their regular price of $7. No coupon is needed, the price will be reflected at the cash register automatically during the 3-day weekend. If you are near a Lucky’s store, and you like buying gift cards, they have a new promotion running until May 16 (2017) at their brick and mortar stores. 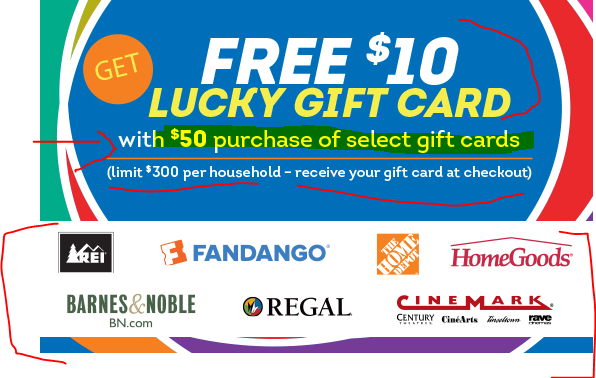 If you buy $50 in participating gift cards, their cash register will spit out a coupon that gets you $10 off your next purchase at the Lucky’s B&M stores. You can buy up to $200 in gift cards per transaction. 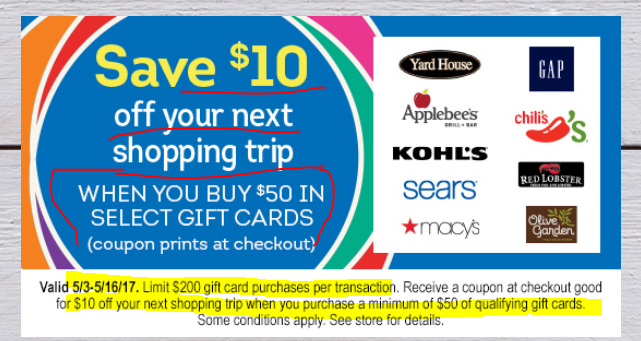 Gift cards in this promotion are a mix of restaurants (Chilis, Applebees, Olive Garden, etC) along with major retailers (Sears, Kohls, Macy’s, GAP, etc).